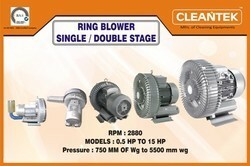 Providing you the best range of ring blower with effective & timely delivery. The Cleantek Ring blower is a non-positive displacement, high volume, low pressure blower that can operate as either a compressor or a vacuum pump. It is also known by other names such as: regenerative blower, Turbine Blower, vortex blower and side-channel blower. The blower consists of an diecast impeller mounted directly on a motor shaft and is rotated at a high speed, about 2880 RPM. On the periphery of the impeller is a large number of radial blades. The impeller is positioned between two endplates with the blades located with a channel on either side. As the diecast impeller rotate and the blades pass the inlet port, a low pressure area is created that draws in air or other gases. The impeller blades impart motion to the air by centrifugal force, throwing it outward and forward, where it follows the contour of the side-channel and is returned to the base, or root, of the impeller. This action is repeated many times, creating a vortex. Each "regeneration" causes the air to gain pressure until it reaches the portion of the housing where the air is stripped from the impeller and discharged from the blower. Cleantek manufacturing air agitation blower for Electroplating process, Metal coating process, Aquaculture , Etc... Various airflow capacity and pressure mranges avilablee in our blowers. leantek Manufacturing turbine blower in various airflow and pressure capacity. This Turbine blower available is 2 different designs. Our Turbine Blower models available in 45 cmh to 1500 cmh airflow capacity.